Visually this may look like it's easier to manage than micromanage tariff editing, but in fact when you create different tariffs, you have to ensure that each tariff's valid from and to dates run consecutively. For most scenarios we would recommend that you use Micromanage. Tariff Title. This is the name of the tariff as it is offered to the customers. Description. Here you can enter more information about this tariff if you need to. Rate per night. This is the price of the room type, per day/night. Valid from/to. This tariff can be offered if a booking is between these dates. Room/Property type. You must cross-reference this tariff with a room or property type. When bookings are made the guest books a room combined with a certain tariff so you must make sure you have at least one tariff for each room type you have at this property. Min/Max days. The minimum/maximum number of days that a booking at this rate can last for. For example you might have one set of prices for bookings that are shorter than a week, so you could set these fields to 1 and 6 and create a new tariff later for bookings that are greater than 6 nights. Min/Max people. You can have one tariff for smaller groups, and another tariff for larger groups, if you wish. Ignore PPPN. PPPN stands for Per Person Per Night. You can opt for this tariff to be charged per room per night instead. Allow Weekends. If set to No then this tariff will not be offered to any bookings that span a weekend day (weekends can be configured in Property Configuration). Weekends only. The inverse of the previous setting. Arrival day of week. You can ensure that this tariff is only valid on certain days of the week. Bookings where the arrival day of the week is different will not be offered this tariff. Min/Max rooms already selected. 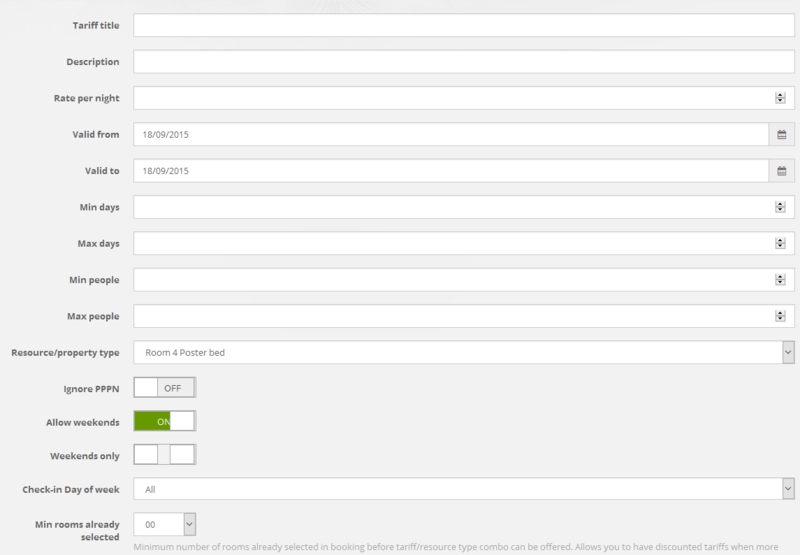 This is a special setting that gives you the option to only offer this tariff if the guest has already chosen one or more rooms in the booking form. Typically it's used by managers who want to offer additional rooms at a reduced rate. Unless you already have a tariff for this room type that's set to 0 (zero) we strongly recommend that you do not use this option.